Sometimes less is more. 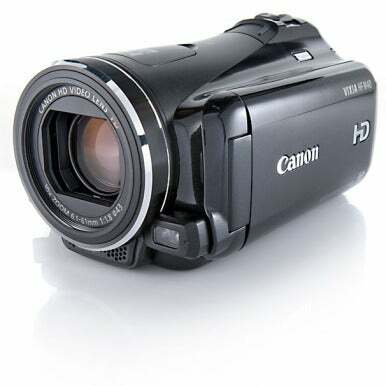 Take, for example, the Canon Vixia HF M40 camcorder. The camera tweaks some features found in Canon's 2010 M-series camcorders, but the most significant change is a slightly larger image sensor with substantially fewer pixels. That loss of pixels provides the camera's biggest gain. The camera's 1/3-inch CMOS sensor uses 1920-by-1080 pixels to capture video. That's only two megapixels, only two-thirds of the three megapixels found on Canon's similarly priced 2010 camcorders and an even smaller fraction of some other camcorders. The low pixel count would hinder a still camera's performance, but it's precisely the number needed for a full HD image. By reducing the total number of pixels, each pixel can be bigger and therefore can get hit by more photons. In theory, using bigger pixels should give the camera better low-light performance and greater dynamic range. In practice, it does. Even in dim light, the HF M40 captures a high-quality video image; it doesn't sacrifice color accuracy or overcrank gain and consequent noise. Under normal lighting conditions, HD video shows excellent color and sharpness, very good exposure control, and smooth motion. The camera's impressive dynamic range preserves detail in both shadows and highlights rather than quickly clipping to black or white. The camcorder captures video at 60 interlaced fields per second (60i). The camera lacks a true progressive mode, instead recording 24p and 30p images onto a 60i stream. Canon's higher-priced camcorders provide true progressive recording; we'd like to see that capability added to camcorders at the HF M40's price, but the current approach only minimally degrades images. Overall, the HF M40 produces the best video image we've seen from a camcorder of its price. The camera records video as AVCHD files at data rates up to 24Mbps, the format's maximum. Since most current video editing applications such as iMovie '11 ( ), Final Cut Pro X ( ), and Adobe Premiere Pro CS5.5 support AVCHD, editing material encoded in the format no longer requires undue effort. Camera control options range from fully automatic to mostly manual. In Auto mode, the camera controls everything other than lens zoom. Eleven scene modes (e.g., portrait, sports, beach) give you some control over the image, with the camera setting functions such as gain and white balance. 24p Cinema Mode emulates the frame rate and warm tonal settings of theatrical films. A manual mode provides lots of image control, but requires digging into the camera's menu system. A respectable complement of features such as backlight correction, focus and exposure tracking, and image stabilization simplify capturing video under a wide variety of conditions. The camera provides a lot of tools; mastering the HF M40 requires investing a little time reading the user manual and working with the camera. 16GB of internal flash memory holds from 85 minutes to six hours of video, depending on compression settings. Two card slots permit additional recording onto SDXC memory cards. The supplied 890mAh lithium-ion battery runs in record mode for about two hours, sufficient for typical users. Canon sells a 1780mAh battery for $120. A 3.5mm jack supports external microphones. The HF M40 is not all Pixar movies and popcorn. The 10x zoom lens performs adequately and has a 35mm-equivalent focal range from 43.6mm to 436mm. We would prefer a wider short end, say 30mm or so. The headphone jack works in manual and automatic modes, but not in Cinema Mode. The camera lacks a viewfinder. The built-in microphone captures clear sound, but the wind filter falls short. Still photos show good color and sharpness, and look respectable enough for sharing on Facebook or as small prints. But the two-megapixel resolution lags far below what you get in even a modestly priced still camera. You access the camera's features through a 3.0-inch LCD touch screen. The screen and menu system functions sufficiently well, but is neither as responsive nor as intuitive as an iPhone. These are all quibbles, not deal breakers, but they point to the biggest challenge facing the HF M40 and every mid-level camcorder. Dedicated HD camcorders like the HF M40 are getting squeezed between the increasingly acceptable video capabilities of smartphones and the fussy-but-pretty video performance of DSLRs. But today there's still a good-sized niche for moderately priced HD camcorders; the good ones combine ease of use, flexibility, and fine video image quality. The Canon Vixia HF M40, with its video-specific CMOS image sensor, is a very good one. In fact, the Canon Vixia HF M40 is currently the best mid-priced HD camcorder we've tested.